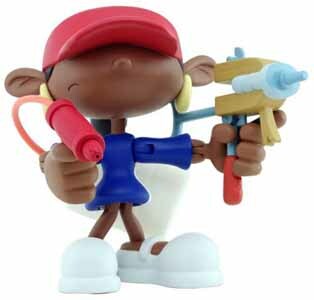 The KND range of 4.5" action figures are pretty impressive. Constructed of chunky plastic, each figure comes equipped with fully working weapons, which are designed to be used by any of the action figures in the range. There's very little chance of breaking anything - as everything is made of high quality, robust, materials. 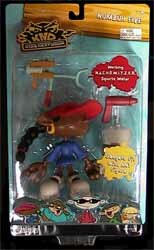 Numbuh Five comes with a fully working N.A.C.H.O.W.I.T.Z.E.R. (Naturally Artificial Cheese Hurling Oversizes Weapon Instantly Totally Zaps Enemy Resistance) gun, which fires water. She also has a S.Q.O.O.S.H.E.R. (Shoots Quarts of Oozing Stuff Heavily Ensnaring Rivals). Both weapons are very well detailed and, as fans of the TV series will no doubt already be aware, look like they have been fashioned from household appliances, and junk laying around the home. Fans of Cartoon Network's KND animated series will not be disappointed by this incredibly detailed action figure.